LEAWOOD — It’s only natural that an ordination Mass might be a somewhat nervous occasion. 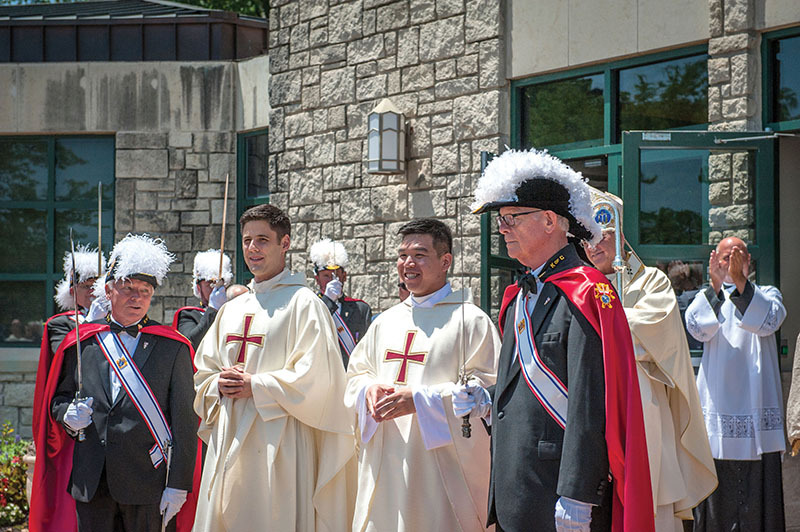 And so it was when Father Quoc-Viet Minh Nguyen and Father Carter Paul Zielinski were ordained to the priesthood on June 30 at the Church of the Nativity in Leawood. The ordinands were ready, calm and collected. Their parents were the nervous ones. Deacon Paul Nguyen, who was just ordained a permanent deacon for the Diocese of Kansas City-St. Joseph on June 9, talked to his son that morning. “He was not nervous at all,” said Deacon Nguyen. “He told his brother, ‘I feel fine,’” said Pham. Father Nguyen told his parents he had been ready for this day for four years. The same was true for the Zielinski family. They, too, had a chance to talk to their son that morning. “He seemed relaxed,” said Ray Zielinski, his father. “He’s doing OK,” said Jennifer. Years of prayer, study and discernment brought Father Nguyen and Father Zielinski to this day. They had been looking forward to it with eagerness. Additionally, they had already been primed for that day when they were both ordained transitional deacons. Father Nguyen was ordained a deacon on May 20, 2017, at the Cathedral of St. Peter in Kansas City, Kansas. Father Zielinski was ordained a deacon on Sept. 28, 2017, at St. Peter’s Basilica in Rome. Now that the big day had finally arrived, members of the Nguyen and Zielinski families reflected on their sons’ journey to the priesthood. “It’s quite amazing,” said Ray Zielinski. “Looking at it from this end, it would seem like a long time. But at this juncture, it seems like only yesterday that he went to Rome. We were nervous about that. It worked out exceptionally well for him. With the benefit of hindsight, Truong Nguyen, Pham’s oldest brother, recalled the first hints of his little brother’s vocation. The ordination Mass even had an international flavor, courtesy of the Nguyens. Their family, which had been scattered at the end of the Vietnam War, was reunited by the ordination. “We had relatives come here from California, New Orleans, Texas and Wichita,” said Deacon Nguyen. One uncle, a priest, came all the way from the Republic of China (Taiwan). There was also a lot of support in evidence from the Vietnamese community of the Greater Kansas City metropolitan area. The designated Vietnamese parish is Holy Martyrs in Kansas City, Missouri. The parish’s women’s choir sang, all dressed in red Vietnamese traditional dress, the áo dài. Many women in attendance also wore áo dài in honor of the day. Anna Pham’s was of light gold silk with darker gold embroidery, and floral embroidering in dark red, pink and green thread. After the ordination Mass and reception, the Nguyen family held a traditional, Vietnamese whole-pig roast dinner at the Church of the Ascension in Overland Park. Archbishop Joseph F. Naumann was the ordaining minister, homilist and main celebrant. Several priests of the archdiocese concelebrated the Mass. Several deacons and archdiocesan seminarians also took part. Father Zielinski was vested by Father Francis Hund, pastor of the Church of the Nativity, and Father Al Rockers, retired. Father Nguyen was vested by Father Patrick Marshall, director of the Newman Center at the University of Illinois at Chicago. The first assignments for Father Nguyen are as associate pastor at Sacred Heart Parish in Shawnee and chaplain to St. James Academy in Lenexa. The first assignments for Father Zielinski are as associate pastor at Christ the King Parish in Topeka and as chaplain to Hayden High School in Topeka.